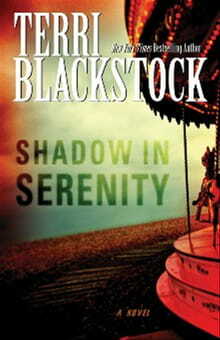 EDITOR’S NOTE: The following is an excerpt from Shadow in Serenity by Terri Blackstock (Zondervan). Logan Brisco had the ­people of Serenity, Texas, eating out of his hand, and that was just where he wanted them. He worked hard to cultivate the smile of a traveling evangelist, the confidence of a busy capitalist, the secrecy of a government spy, and the charisma of a pied piper. No one in town knew where he’d come from or why he was there, and he wasn’t talking. But he made sure they knew he was on a mission, and that it was something big. From the moment he drove his Navigator in, wearing his thousand-dollar suit and Italian shoes, tongues began wagging. Rumor had it that Logan Brisco was a movie producer scouting talent for his latest picture. But the weekly patrons of the Clippety Doo Dah Salon were sure he was a billionaire-in-hiding, looking for a wife. And the men at Slade Hampton’s Barbershop buzzed about the money he was likely to invest in the community. Two days after he arrived, the UPS man delivered two large boxes marked “Fragile” and addressed to “Brisco, c/o The Welcome Inn.” One of the boxes had the return address of a prominent bank in Dallas. The other was marked “Hollywood, California.” The gossip grew more frenzied. For two weeks, he chatted with the ­people of the town, ate in its restaurants, shopped in its stores, bonded with its men, flirted with its women. As soon as speculation peaked, Logan would be ready to go in for the kill. This one might be his biggest score yet. The next step would be to hold one of his seminars, the kind where ­people came in with bundles of cash and left with empty pockets and heads full of dreams. That was what he was best at. Building dreams and taking money. On his second Saturday in town — which consisted mostly of four streets of shops, offices, and restaurants — the sun shone brightly after a week of rain. It was the day Serenity’s citizens filled the streets, catching up on errands and chores. Perfect. “Well, yes, I guess it would,” she said. Julia breathed a laugh and rolled her eyes. With a wink he was out the door, leaving her staring after him with a wistful look. Stepping out into the cool sunlight of the May day, he looked down at the box of fliers. It shouldn’t be hard to pass all of them out by tonight. And having the seminar at the bingo hall in the town’s community center was a stroke of genius. That place drew hundreds of ­people on Saturday nights, and tonight they would just come an hour earlier to hear him. By tomorrow, he’d be riding high. He would hit the hardware store next, since it seemed inordinately busy today. Easy marks there — he’d hook every one of them. He stopped, waited for a car to pass, then started to dart across the street. The sound of a Harley hog stopped him. It growled its warning as it tore its way up the street, breaking the relative quiet that he had come to associate with the town. He stepped back when it passed, but when its wheel cut through a puddle, it splashed mud onto the shins of his pants. “Hey!” he yelled. The driver apparently didn’t hear. Logan stared after the bike, which carried a woman and a little boy. The petite biker’s shoulder-length blonde hair stuck out from under her tangerine helmet, softening the impression created by the powerful bike. As she went up the street, ­people looked her way and waved, apparently pleased to see her rather than annoyed at the disruption. Logan tried to rein in his temper as she pulled into a parking space and cut off the loud engine. It wouldn’t pay to ruin the image he’d so carefully cultivated here by throttling the first woman who had the gall to ruffle his feathers. It was an accident, he told himself. An accident she would probably be glad to apologize for. The woman pulled off her helmet, revealing a head full of baby-blonde hair. She looked like that little actress Kristin Chenoweth, with a flash of fire in her eyes. He shifted the fliers from one arm to the other and gaped at the woman as her boy got off the bike. She didn’t seem to have the stature to hold up a Harley, much less ride one, but she stepped on the kickstand with little effort. With effort, Logan swallowed his ire and flashed the boy that political grin. “Well, I guess they are. Maybe I’ve been a little too secretive. My name’s Logan Brisco.” He reached out to shake the woman’s hand, but she seemed not to notice. He settled for shaking the boy’s. The woman didn’t take the fliers, but the boy grabbed the stack he offered. “Me too? Do I get to come?” the kid asked. He chuckled, not certain how to take her. “I’m never wrong,” she said. “Ask anybody.” Holding her helmet by the chin strap, she headed up the sidewalk. Logan watched her stroll away from him, her son at her heels. Clearly, she didn’t need or want Logan’s attention. He would have staked everything on the probability that she drew men’s gazes wherever she went. When she reached the hardware store, she grabbed Jason’s fliers and glanced back, as if to make sure Logan was watching as she dropped them into the trash. Logan grinned. This would be even more fun than he’d thought. He might have to stay longer than he’d planned, just to meet the challenge of the little lady whose first name he didn’t know. The ladies of the Clippety Doo Dah Salon cackled and fluttered as Logan stepped inside, breathing in the scent of hair spray and peroxide and trying not to cough. “Hello, ladies,” he said with his best grin. A dozen gals crooned back their hellos and preened with their rollers, their rods, and their teased tresses, as if he could see past them to the beauty that lay just moments away. Across the room, he saw Julia Peabody sitting in front of the hair dryers, where she had the attention of at least five women. Perfect, Logan thought. She had to be talking about him. “Mr. Brisco!” Lahoma Kirtland called from the sink where she was dyeing the head of Mildred Smith. Abandoning her client, she held her gloved, red-dyed hands up like a surgeon and made a beeline across the shop. A titter of giggles made its way around the shop as he put a flier into each lady’s hand. The door clanged open behind him and closed with a tinkling bell. He turned around and saw the biker chick bouncing her son on her back as she cut across the salon toward Lahoma’s station, zigzagging and swaying, pretending she might drop the boy. Holding on for dear life, he giggled and shouted for her to stop. The blonde’s eyes met his, and contempt hardened her features again. Letting her son slide down her back, she blew her wispy bangs out of her eyes and came toward the beautician, who held his flier with her rubber gloves still wet with red dye. “I’ll take some,” a woman beneath a dryer called. “Aren’t you going to get him his haircut?” Lahoma called after her. The door clanged shut behind her, and Lahoma slapped her red hands on her face. “Oh, my word, I forgot!” She ran to where Mildred sat with dye dripping down her forehead, hastily pushed the red head back into the sink, and turned the water on. “She was brought up in a carnival,” Lahoma replied. So that was it. She had street smarts. That might get in his way. Laughing, Logan offered his goodbyes to the ladies and went back outside. Carny and her son sat on the bench outside the barbershop, a block down. He strolled toward them as if in no particular hurry. She was probably in her late twenties. That savvy edge she had, that mature expression on her face, that lack of innocence only made her more attractive to him. Stay away, Logan, he warned himself. That had been Montague’s first rule. Never let a woman get under your skin — especially one who had the goods on you. It could be the kiss of death. Yet he liked a challenge, and he couldn’t resist confronting her again . . . just one more time. “Of course I did,” he said, surprised. Why did her comeback delight him so? Was it that she stared back at him, undaunted and unflattered by his close scrutiny? Or that she had his number, or thought she did, and wasn’t going to let him get away with a thing? “Go,” she said, shooing him away. When he was gone, she brought her gaze back to Logan and stared at him as if waiting for him to explain why he was standing there with his foot on her bench. Logan didn’t know whether that was meant as a threat or a challenge, but something about it delighted him more than anything had in years. Grinning, he picked up his fliers and started up the street. He wasn’t just going to get rich in Serenity. He was also going to have the time of his life, with this little fireball who called herself Carny.